We are here because of the dedication and determination of our volunteers! 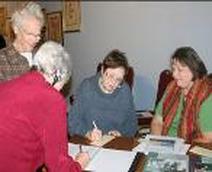 Our valued volunteers are the backbone of the Treasures. Volunteers are needed to keep the museum open, act as hosts for visitors, organize donations and collections, and help with other special projects as they come up. Wednesday mornings at the museum between 10am and 12pm or call 850-973-3661.